Security forces demolish Jewish family's home - without warning. Israel Police and Border Police forces arrived on Monday with Civil Administration officials at the Binyamin-region Yishuv Hada'at Farm. According to residents, the forces destroyed a family's home and treated the family violently, using tear gas against those who attempted to protest the destruction. Otzma Yehudit CEO Tzvi Sukkot, who was at the scene, suffered both from the tear gas and from beatings he received from the police. Sukkot was transferred to another location for medical treatment. Meanwhile, the Border Police and Israel Police officers arriving to demolish the family's home were met with rock-throwing and violence. 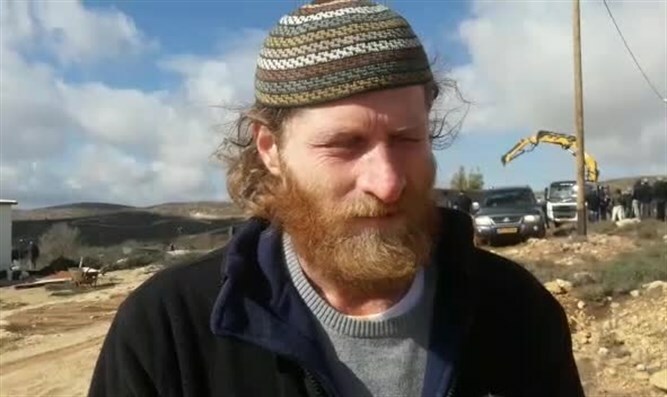 Yishuv Hada'at resident and Otzma Yehudit activist Meir Bartler said, "The security forces acted with extreme violence. It's totally unjust to eject a family with babies from their home on a winter day. We're protesting that as well. This situation cannot continue, and the Israeli government and all parties involved are completely responsible for the despicable act perpetrated here today." "We will no longer tolerate activities like this, and we call on the public to protest." The demolished home was a portable prefab structure with wood siding. A new policy allows the Civil Administration to evacuate a home without official permits within 60 days of the home's construction. Though Israel regularly destroys Jewish homes and other buildings whose buiding permits are delayed or non-available, rarely is the Arab sector's rampant illegal building, road construction, and land takeovers noted. Even more rarely are the Arab-owned structures demolished, and when they are, the court will often intervene and cancel the demolition. Jews who have bought or built homes with government encouragement have been forced out of their homes when Arabs later claimed questionable land ownership, but there have been cases where Arabs built illegally on privately-owned Jewish land and the courts ruled that compensation could take the place of demolition.